This pack contains the printed textbook and access to Connect and Learnsmart. 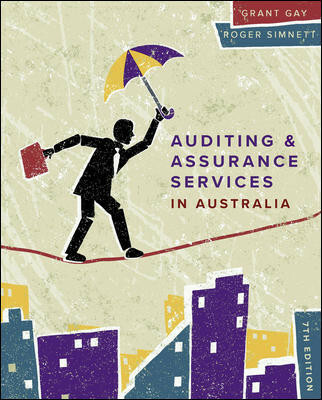 Auditing and Assurance Services in Australia 7e, reimagines Gay & Simnett’s highly regarded text for a new generation of learners. While continuing to provide students with the theoretical concepts they need to succeed, this edition features more practical examples and real-world applications to allow readers to immediately apply what they have learnt. The seventh edition continues to help students master auditing concepts through its strong visuals and engaging content. Underpinned by a comprehensive update to the content, auditing standards, end-of-chapter exercises and integrated with a wealth of interactive and highly personalized digital learning resources, Auditing and Assurance Services in Australia 7e is the complete learning resource for today’s Auditing students.